Big market declines come with a recession, as in 2008. But recessions are almost as hard to forecast as stock prices, and for much the same reason. If we knew with confidence that a recession would happen next year, businesses would not invest or hire, and people would not spend, and we’d have a recession now. Recessions do have some momentum. But the cyclical indicators of the real economy are strong, much stronger than they were in 2007-2008. Unemployment is 3.7%. 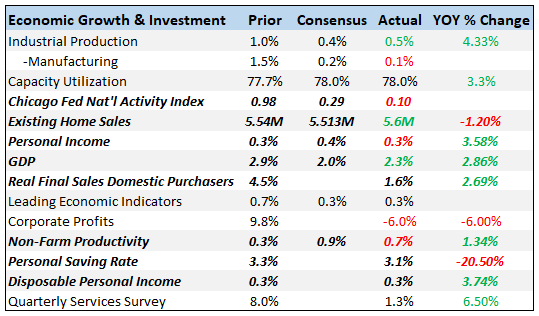 There is no slowdown in real GDP growth or industrial production, or business investment in the most recent data. Inflation is close to the Fed’s target, so there is little reason to fear the Fed will quickly raise rates and cause a recession. Now, the market aggregates more information and faster than the rest of us. Still, the lack of any slowdown adds weight to the suspicion that this correction may pass as well. In thinking about the economy, remember that it has passed from “demand” to “supply.” At 3.9% unemployment, we cannot get greater growth from simply putting unemployed people and machines to work. As we complete the transition from a demand-limited economy to a supply-limited economy, it is perfectly natural for interest rates to rise. One or two percent above the inflation rate is perfectly normal. As interest rates rise, it is perfectly natural for interest-sensitive sectors like housing and autos to decline a bit – but other sectors do better. Demand shifts between products, and auto or housing slowdowns do not mean an overall slowdown. 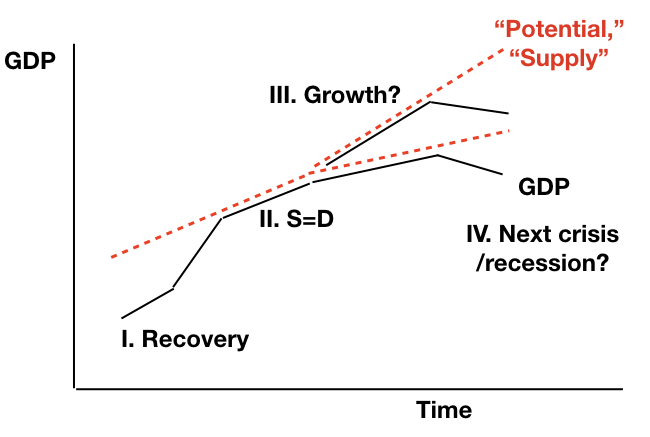 The economy no longer needs or can use monetary or fiscal “stimulus.” Now growth must come more productivity. Growth-oriented policy requires efficiency, “structural reform,” better incentives, not just money in pockets. In my view, the US has gotten an extra percent of growth, mostly from deregulation and a bit from the incentive effects of the tax cuts. But these are over, and further reform is unlikely. So a growth slowdown is certainly in the cards. What about the yield curve? It is flattening – the difference between long-term rates and short term rates is narrowing. And an inverted yield curve has, historically, been a good forecast of a recession to come. But we are not yet at inversion, as the graph shows. Moreover, there have been long periods of nearly flat yield curves in the past, when the “supply” economy kept growing before the next recession, most notably the mid 1990s. In fact, if inflation remains contained, it is possible that the world starts to resemble earlier eras with permanently inverted yield curves. In a non-inflationary environment, long-term bonds are safer for long-term investors. Last, the form of inversion matters as well as the fact. An inversion that comes from the Fed quickly pushing up short rates to cause a slowdown, fighting inflation, is likely to, well, cause a slowdown. An inversion that comes when long-term rates plummet, seeing trouble ahead, is likely to be followed by trouble ahead. We have neither of those circumstances. So what is going on? I hazard a guess. Volatility occurs when there is great uncertainty. Investors are worried big events are on the horizon, and can’t quite figure out what is going to happen. Prices aggregate information, so seeing a price decline can make you think other people know something you don’t in a time of great uncertainty. We see this clearly in studies of high frequency data, when bond markets are adapting and digesting Fed statements, and we know there is no other news to react to. We are, no doubt, in a time of high uncertainty about policy and politics. Volatility broke out almost coincident with the November election, and I think the markets are trying to digest just what the political chaos of the next two years means for the economy. Surely no major growth-oriented economic reforms will come out of Congress. Congressional democrats will bring the full weight of the legal system against the Administration. Cabinet secretaries trying to clean up regulation will have a hard time when being constantly subpoenaed. The government shutdown over 1/10 of 1% of the Federal budget devoted to a border wall is emblematic. It is, of course, entirely symbolic as any border wall will be stuck in the courts for decades. But it is precisely when issues are symbolic that compromise is impossible. So the best economic news that markets can hope for is two years of complete government paralysis, and therefore a return to 2 percent or so growth. Things could be much worse, and markets know it. A large policy blunder in the next two years, such as a big trade shock could well happen. More deeply, the US is now unable to respond to any genuine crisis — economic, financial, military. Imagine that another banking crisis hits, and President Trump asks Congress, again, for a trillion bucks to bail out banks, and another trillion for fiscal stimulus. Or imagine if he does not, and whether the Administration can implement better ideas to fight a new and different crisis. Imagine what happens if China invades Taiwan, or a big bomb goes off in the middle east. Europe is not in much better shape. It has followed the Augustinian approach to structural reform – Dear Lord, give me reform, but not quite yet. Italian banks, and too many German banks, are still stuffed with Italian government debt. Brexit, Cinque Stelle, and Gilets Jaunes mean that pro-market, free trade, growth-oriented structural reform not likely, and there is a limit to what even the ECB can do. China is as usual obscure, and more fragile than they want us to believe. Throughout the world, government debt remains the big danger. Where is there a lot of debt, no plan to repay it, shady accounting, extend-and-pretend, off-balance sheet guarantees, and the debt is mostly short term and prone to runs? Government debt. If a serious recession comes, in a time of dysfunctional government, it may well provoke a government debt crisis, which would be an economic conflagration beyond anything we have seen. So, we live in a time of great uncertainty, brought about by great political uncertainty. Great uncertainty leads to volatility. 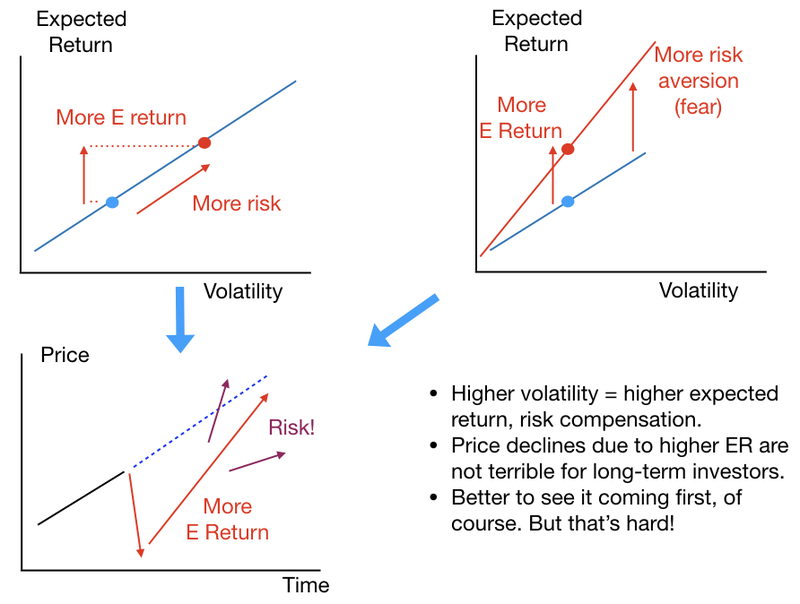 Volatility means that stocks are more risky, and thus must pay a greater expected return to get people to hold them. The only way for the expected future return to rise, is for today’s price to go down. So we see a correction – mild so far, to compensate for the mild risk of holding stocks through a few months of ups and downs. There is a silver lining to this story. 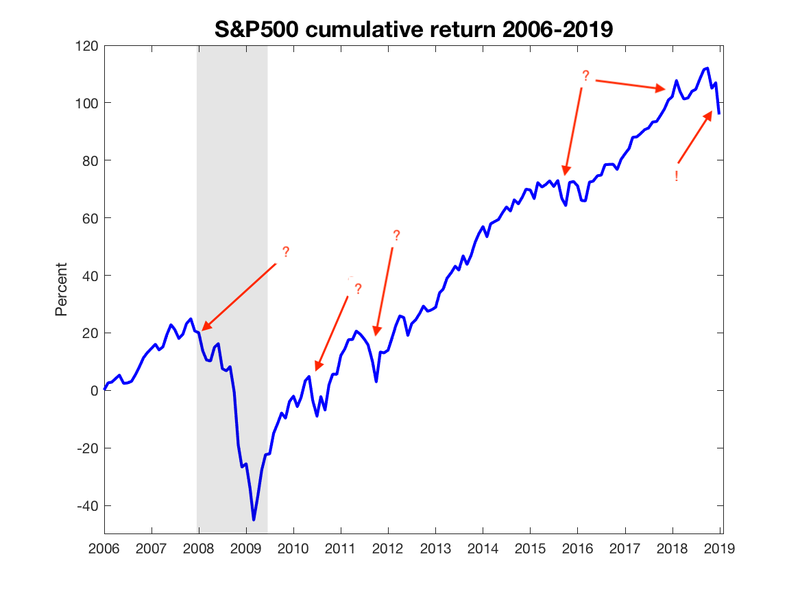 If prices are low because required returns have risen, then if nothing bad happens, long-term investors will do fine. Bond prices go down when yields go up, and the larger yields eventually make up for the price loss. But greater uncertainty means a greater chance that something truly terrible will happen. As well as a greater chance that it won’t. The big message of the moment is that risk is higher. Managing risk, not following some sage’s directional bet, is the best investment advice anyone should start with.